5% Solid Cobalt. Not Plated or Dipped. Don’t be fooled! Features: This is a new adjustable drill stand, perfect for shop or home use. It has a solid column bar and sturdy base with slots for fitting a machine vice. This Plunge Drill Stand is ideal for holding your drill steady during use and allows for much more accurate drilling than hand-held operation. 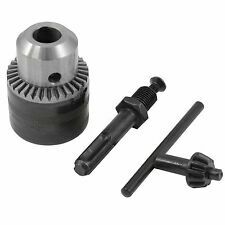 Depth gauge Plastic collar insert Mounting holes Allen key & holder - for adjustment Specifications: Total height: 400mm Drill boss diameter: 38mm / 43mm Shaft diameter: 25mm Drilling depth: Max. 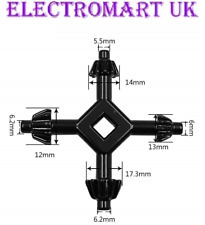 60mm Base Material: Aluminum package included:. LOOK AT OUR SHOP, WE SELL EVERY SIZE/TYPE OF DRILL BIT! 1pcs HSS Spiral Grooved Step Drill Bit 5-35. ♣ High Quality Material: Made of high quality HSS. 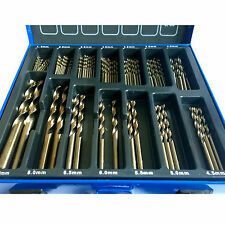 ♣ Professional Step Drill design for precision drilling different size holes from 5mm up to 35mm. 1 x 5-35mm Spiral Grooved Drill. Mitre, Site & Table saws. Drill Bits & Chisels - SDS . Drill & Flat Bits & Holesaws. Drill Bits & Chisels - SDS Max. Sanding - Flap Discs. Impact Drivers & Wrenches. Multi Function Tools. Blades - Recip & Alligator Saw. Material: HSS steel. Finish: Titanium Coated. Besides Different Computers Display Colors Differently, The. 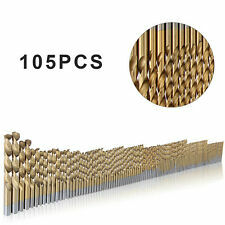 105PCS SET: Size & QTY: 1.5mm x 17; 2mm x 17; 2.5mm x 16; 3mm x 10; 3.2mm x 10;3.5mm x.
Nitride coated drill bits for longer life and durability Supplied in metal storage case (not cheap plastic like others) Set includes sizes: 1.5 - 6.5mm. Mag Drill Cutters, . Job Lot!! Vintage wolf saphire drill 240v - sold individually.